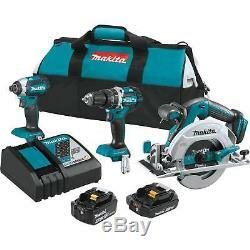 Makita XT333X1 18V LXT Lithium-Ion Brushless Cordless 3-Pc. Combo Kit (4.0Ah) (2.0Ah). NEW in the Retail packaging. 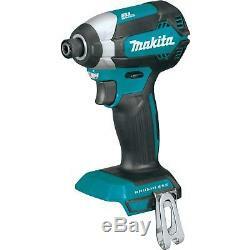 1/2 Hammer Driver-Drill (0-500 & 0-2,000 RPM) (0-7,500 & 0-30,000 IPM); 530 in. Variable speed Impact Driver (0-3,400 RPM & 0-3,600 IPM) provides 1,500 in. 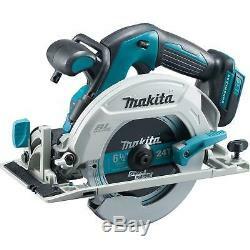 Circular Saw delivers 5,000 RPM for faster cutting and ripping. Efficient BL Brushless motor is controlled to optimize battery use for up to 50% longer run time. XPH12Z, XDT13Z, XSH03Z, 1 ea. 18V Compact Lithium-Ion battery, 1 ea. 18V LXT® Lithium-ion battery, rapid charger 110v input and bag. AN AWESOME TOOL AT AN UNBELIEVABLE PRICE! Sale goes while supplies last! The Makita 18V LXT® Lithium-Ion Brushless 3-Piece Combo Kit (model XT333X1) gives you three efficient brushless tools for drilling, driving, fastening, and cutting. You also get one each of the categorys fastest-charging 18V 2.0Ah and 4.0Ah batteries and the expansive breadth-of-line of the Makita 18V LXT® battery platform, so your batteries will power the expanding range of Makita tools and accessories. The XT333X1 includes a variable speed ½ hammer driver-drill with two speed settings (0-500 & 0-2,000 RPM) with a full 530 in. The variable speed impact driver has a full 1,500 inch-pounds of Max Torque for efficient fastening. The 6-1/2 Circular Saw delivers 5,000 RPM and is equipped with Makitas Automatic Speed Change technology to adjust speed and torque during operation for optimum performance. Its part of Makitas expanding 18V Lithium-Ion system, the worlds largest cordless tool system powered by 18V Lithium-Ion slide-style batteries. Makita 18V Lithium-Ion batteries have the fastest charge times in their categories, so they spend more time working and less time sitting on the charger. For improved tool performance and extended battery life, Makita created Star Protection Computer Controls. Variable 2-speed 1/2 Hammer Driver-Drill (0-500 & 0-2,000 RPM) (0-7,500 & 0-30,000 IPM) delivers 530 in. The BL Brushless Motor eliminates carbon brushes, enabling the BL Motor to run cooler and more efficiently for longer life. Efficient BL Brushless motor is electronically controlled to optimize battery energy use for up to 50% longer run time per charge. The electronically-controlled BL Brushless Motor efficiently uses energy to match torque and RPM to the changing demands of the application. Extreme Protection Technology (XPT) is engineered for improved dust and water resistance for operation in harsh conditions. Equipped with Star Protection Computer Controls to protect against overloading, over-discharging and over-heating. 18V LXT® Lithium-ion 4.0Ah battery BL1840B reaches full charge in 40 minutes or less. 18V Compact LXT® Lithium-Ion 2.0Ah battery BL1820B reaches a full charge in 25 minutes or less. Rapid Optimum Charger has a built-in fan to cool the battery for faster, more efficient charging. Rapid Optimum Charger communicates with the battery's built-in chip throughout the charging process to optimize battery life by actively controlling current, voltage and temperature. XDT13Z, 1/4 brushless impact driver. XSH03Z, 6.5 inch brushless circuar saw. Dc18rc rapid charger 110v input. 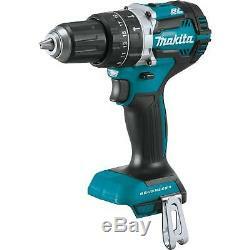 The item "Makita XT333X1 18V LXT Lithium-Ion Brushless Cordless 3-Pc. Combo Kit Brand NEW" is in sale since Sunday, November 18, 2018. This item is in the category "Home & Garden\Tools & Workshop Equipment\Power Tools\Power Tool Sets". The seller is "discounttoolmall" and is located in Chapman, Kansas. This item can be shipped worldwide.